Original Poster vs. Blu-ray: Ben Stiller Presents... 'Heavyweights'? Lo Mejor de "lo Peor"
Someone has taken their love of stooges one step too far. This one is for Raimi (and stooge) fans only. It's really not that bad, I think that Sam perhaps took his stooge imitating(as seen in all Raimi movies) a little far. 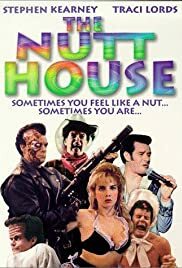 In fact you can imagine this being a movie from the Stooge/Marx stable the main character(who was written for Bruce Campbell obviously) is a mix of Harpo Marx & The Stooges. It kind of trails off towards the end. The acting is all over the top silliness with sight gags stuck in everywhere for the hell of it. Although he didn't want recognition as writing this I can imagine this is a movie that Sam still enjoys watching it just seems his level of humour.